Americans enjoy the cheapest electricity in the World – thanks to ultra-cheap gas, plenty of nuclear power and a fair share of hydro among their power mix. 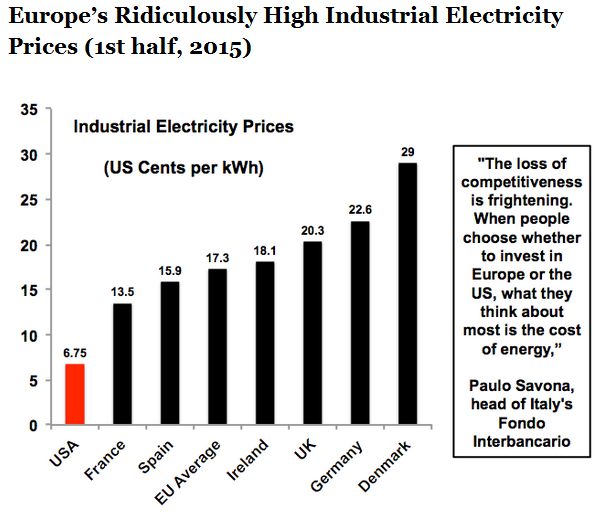 However, how long its natural advantage over countries who have tied their hopes on the Wind Gods lasts, depends entirely on how soon it can pull the rug on the massive subsidies for wind power: cut the subsidies and wind power investment shrivels like the Wicked Witch of the West being sloshed with a bucket of water. Americans are now starting to work out that the wind itself might be ‘free’, but that trying to run an economy on it comes with a cost so insane that it can’t really be measured. Connie Krapp: At What Cost Wind and Not Coal? Last week, Great River Energy announced it will shut down its coal-based Stanton Station power plant. If nothing changes in our federal government’s approach to electricity supply, we in North Dakota can expect more coal plants to go down—and more wind farms to go up. 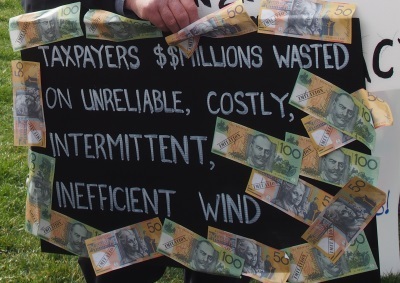 But before we bless another wind farm in this state, it might be important to understand the cost. No, wind generation is not free and it is not affordable—not without whopper subsidies from the federal government (in other words, taxpayers like you and me). For the period 2010 – 2013, for every unit of energy produced, wind generation was subsidized by the US federal government 52 times more than for conventional fossil fuels according to the Institute for Energy Research. Federal spending on solar energy is much higher—it received 345 times the cost to produce a unit of energy from coal, oil or natural gas. According to the Energy Information Administration, during the period 2010-2013, US federal government subsidies to renewables blew up—increasing 54 percent, from $8.6 billion to $13.2 billion. More than one-third of that was spent on wind, despite that fact that, in the same time period 2010-2013, wind generation only powered 4 percent of US consumption. But, never mind the monstrous cost. The Obama administration under a Clean Coal Plan has committed the US to the goal of generating 20 percent of its electricity from renewable sources by 2030. This would triple the amount of wind and solar-generated electricity on the national grid. When you consider what wind and solar bring to the electric grid, this endeavor is sobering. Because the wind doesn’t blow all the time and the sun doesn’t always shine, these types of renewables have to be backed up by a firm supply of energy such as gas or coal. Several foreign countries, which began transitioning to renewables as far back as the early 1990s, have already discovered that generating electricity with weather-dependent technology is both costly and inefficient, and threatening to the reliability of the grid. In May, the Danish government cancelled construction of five wind farms because the cost of wind-based electricity was too expensive for consumers. Germany’s transition to wind and solar has been so disastrous that the government is now replacing most of its wind and solar subsidies with a system of competitive auctions in which the cheapest electricity wins. It had to do something—after two decades of pushing renewables, the average German pays 39 cents per kilowatt hour (the average American pays 10.4 cents). By 2019, Germany plans to get rid of 6,000 megawatts of wind power capacity. It has 12 coal-fired stations due to open by 2020, adding to two new coal stations in 2012, and six more in 2013. Along with these coal plants, Germany has 27 gas-fired stations either already online or in the works. South Australia’s aggressive drive to renewables came to a head earlier this month when electricity prices reached $14,000 a megawatt hour. Some say it is what happens when a jurisdiction dives headlong into renewable energy while at the same time phasing out traditional energy sources such as coal or gas. If the US consumer of electricity is to be saved from such a future, we all must advocate for smart energy decisions. While we all want to reduce carbon emissions and ensure clean air for generations to follow, we must be realistic. Despite the fact that 175 countries around the world agreed this spring to reduce emissions by replacing coal and gas with renewables, it is not happening. According to Greenpeace, China is on pace to open one new coal-fired plant each week until 2020. Other countries are building coal plants too—and more than half of them are using inefficient subcritical technologies—meaning they are spewing more carbon emissions into the air than many of our existing US coal plants. As we speak, India has 297 coal-fired power plants under construction and another 149 being planned. Japan, 45. Indonesia is doubling its coal capacity. Vietnam is adding 40 gigawatts (that’s 40,000 megawatts) of coal. Some estimates put the number of coal plants presently under construction worldwide at 2400. In other words, the US is shutting down cleaner plants than other countries are building. A recent study confirms the conclusion you can draw from such a process—that solar and wind have had “extremely limited impact” on carbon emissions worldwide. Why, then, are we all cheering for the development of wind farms, especially here in North Dakota, the land of plentiful coal, oil and natural gas? That’s something we need to ask ourselves. As reported in a July 16 news release, Randy Christmann of the North Dakota PSC was quoted as saying that wind farms are overly subsidized. He worries that more coal-fired power plant closures could result in a less reliable and more expensive electric grid. Sen. Heidi Heitkamp, a Democrat who has been critical of the Clean Power Plan (but supports wind development), recently introduced a bill that would expand tax credits for carbon capture and storage projects. This is the right course for the US. We should work on technology that would ensure our coal plants a future. We should oppose subsidies like the federal Production Tax Credit for wind and solar until those technologies become more efficient and cost-effective. As far as the future of wind as an energy source here in North Dakota—who wants to pay the price? As the technology now stands, all wind turbines add to our energy mix is monstrous cost. They kill birds and bats, create health concerns and, as we’ve seen already in western North Dakota, pit neighbors against neighbors. All while investors such as Warren Buffet (whose company has invested billions into wind) add to their fortunes. After all, those federal tax dollars that we are all paying have to go somewhere. Nice to see South Australia strutting her stuff on the World stage – for all the wrong reasons. If Americans get a grip on the greatest economic and environmental fraud of all time, who knows, they might avoid the same social and economic disaster that’s playing out in SA. « Remember Life Before Wind Turbines Were Speared Into the Heart of Your Community?